I posted a link from ‘Planes Trains and Automobiles’ on Facebook last night (below), as this movie as well as ‘Uncle Buck’, have endured as trusted comedies that, no matter how often I see them, still move me to tears and stitches. What I love about the scene above is the sheer craftsmanship – all those visual gags followed by that lovely silence as the case goes flying. Fabulous. Prolific director and screenwriter John Hughes, enjoyed a rich vein of extraordinary work in the eighties, and his impact on popular cinema cannot be underrated – ‘The Breakfast Club’, ‘Ferris Bueller’ and ‘Home Alone’ are just three of an iconic career. For me though, his work has been largely overlooked and sidelined by history – I guess it’s easy to do that with frothy comedy, especially when it’s wearing leg warmers and shoulder pads. 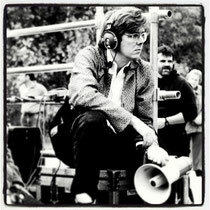 I felt it twenty years ago, and I feel it even more now, John Hughes was one of the greatest American filmmakers. And it got me to Googling for interviews with the man himself. Blimey, there are precious few out there, he was quite a recluse. Below is the best one I could find, recorded by the AFI. So I decided to clean it up, convert it into a single file and upload for filmmakers who want to know more about the extraordinary and elusive talent that was John Hughes. Enjoy.